I’ve been trying to improve my 11 year old’s vocabulary, so we tried out The Critical Thinking Co.™‘s Critical Thinking Detective: Vocabulary. I’m going to give you the details on this book, how we used it, and how it worked for us. 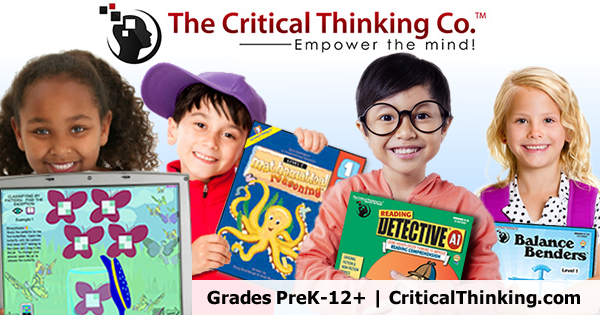 Critical Thinking Detective: Vocabulary is meant for Grades 5-12+. It’s full of difficult vocabulary of the type that a person needs to know well to get high scores on the SAT or ACT. 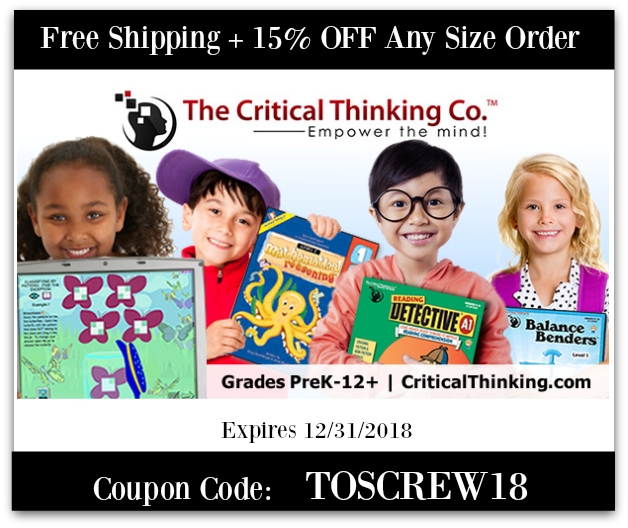 The Critical Thinking Co.™ has over 200 items in their catalog. They cover various topics, including various Language Arts topics, Math/Science, and Logical Thinking. Our book is about Logical Thinking. From the cover, you can see that it’s got a detective. Inside, there are 12 “detective puzzles” where the student gets to be a detective and figure out who did the crime in question. The clues have advanced vocabulary. To solidify some of that vocabulary, there’s a traditional “fill in the blank” page that comes after each detective story. In our homeschool we don’t really worry about grades or test scores FOR NOW, but I’m well aware that some day the PSAT, SAT and ACT will beckon, and students who do well on those tests could have a better chance of getting a college scholarship. I ended up sitting side-by-side with my 5th grader to work on this together. He’s 11 years old and has actually already finished 5th but hasn’t started 6th yet, so he’s not a young 5th grader by any means. He’s an excellent reader and has no problem reading adult level books, and he’s already a good way into pre-algebra. BUT this is not the kind of book that he could do on his own. We ended up talking through the problems together and reviewing some word definitions. The vocabulary fill-ins were completely beyond him, so I opted to talk those through and just read the sentences to him to teach it, rather than except him to figure that part out. It was so far beyond him, and he was so frustrated by it, but he wanted to learn the words. I treated this like I would when introducing a new book to a child who isn’t reading well yet – you preview the book first and let them get comfortable with it before you expect them to just dive in on their own. Reduce frustration and don’t go beyond a child’s frustration level. We didn’t write answers down so that later on, maybe in a year or two, he can come back to those for some quick reviews. Maybe we’ll just continue to read those sentences so that he learns the words in context. How Did Critical Thinking Detective: Vocabulary Work for Us? As I’ve already started to explain a little bit, this book was too advanced for my son to use on his own. I thought he would be fine at the younger end of the recommended age guidelines because he’s already such a good reader and very good at math, but no. I think this book would be more appropriate for 7th grade and up. Give children ample time to move out of that concrete operational developmental stage before introducing this. My son loved doing the puzzles and would have finished all of them in a day or two if I had not kept telling him to slow down. He wants more books like this. He did well with the logical puzzles. I wasn’t surprised at that – after all, he is very mathematically minded, and despite being barely 11 he’s shown that he’s capable of abstract, critical, questioning thought. Our Amazon Alexa didn’t know a lot of the vocabulary used, so we had to look things up the “old-fashioned way” by Googling it. Hah hah. The last thing that was frustrating for my son was that he kept wanting to say that he didn’t know who was lying. We’ve watched some crime shows and he kept doubting the statements. The instructions state that all of the statements are true. These are logic games, not true detective scenarios where you might really have people lying. Overall this was a really fun way to introduce logic games and improve vocabulary. You can get a special coupon code right now for a discount!!! !